While many different materials can be used to string beads, the most popular and durable thing to string your beads on is beading wire. If you shop at a regular craft store, you might not be able to find a huge variety of wire, but if you shop online or at a beading store you will find a vast selection, and it can be a little confusing. The first thing that is important to know about the wire is its gauge. Just like any other kind of wire, beading wire is measured by gauge. The gauge number has to do with how thick or thin the beading wire is. The higher the number your wire's gauge says, the thinner it will be. So a 32-gauge wire is thinner than a 22-gauge wire. Gauge is the standard measurement in America, but a millimeter measurement is used in other parts of the world and by some companies. This measurement can be helpful if you know the size of the holes in your beads. Generally, 20-gague is about .80 millimeters, 21 to 22-gauge is .65-.71 and 24 to 26-gauge is .40-.50 millimeters. Accuflex measures its wire by diameter instead of gauge. Its wires range from .012 to .024 inches, which ranges from .30 to .60 millimeters, or from around 30-gauge to around 22-gauge. More beading wire is made of base metal. You can also find wire made of such materials as copper, brass, stainless steel and sterling silver. 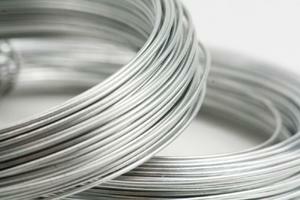 Different materials of wire are good for different purposes, or you can use base metal wire for any project. Metalwire can also be found in many different colors, from the plain silver color you'll find at your local craft store to black, white, magenta, pink, blue, purple, gold, yellow, green, orange and more. Different colors of wire can be fun to work with when you are wrapping beads with wire, so some of the wire will show, or when you are using clear beads. Another consideration that is particularly important to more experienced beaders is the hardness of the wire. Wire is usually separated into three main hardness categories: dead soft, half-hard and full-hard. Dead soft wire is very flexible and great for wire-wrapping and sculpting projects. half-hard is a little bit harder and a little less flexible, while full-hard wire is very stiff and harder to manipulate by hand. The packages of wire you are looking at might not say what the hardness of the wire is, but most of the beading wire you will find in craft stores is dead soft or half-hard, which is great for most projects. It's also important to consider how much weight the wire you want to use can hold. How much weight a wire can hold is usually a factor of the gauge. Heavier wires can naturally support more weight. How the wire is constructed can also make a big difference in how much weight the wire can hold. Accu-Flex, for instance, makes its wires in a range of stand counts from seven-strand to 49-strand. Individual wires or bundles of wires are combined and coated with nylon to provide a strong yet flexible wire. The thickest 49-strand wire can hold up to 40 pounds. You probably won't want to wear a piece of jewelry that weighs 40 pounds, but it's good to know that when making something artful you don't have to worry about your wire breaking. You can usually find the weight limit for the wire on the package. Even with the above guidelines in mind, there are different uses that are suited to different kinds of wire, mostly because the wire must be small enough to fit through the holes in your beads. Wire in the gauge range of 22 to 24-gauge is good for a lot of general beading projects done with glass beads or crystals. Thirty and 32-gauge wire are better for work with seed beads and weaving projects that you might want to do with wire. This gauge range gives you similar flexibility and strength as beading thread, so it's really up to your preference if you'd rather use thread or beading wire.